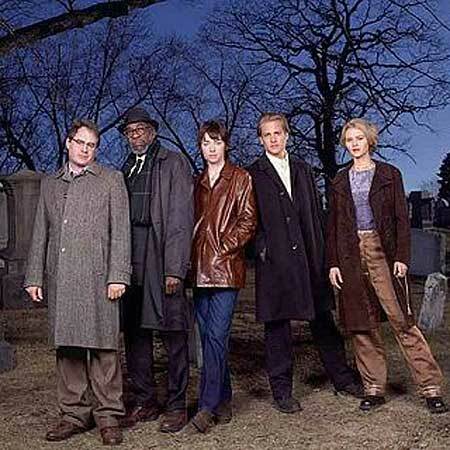 The Others is a 2000 paranormal television series which lasted for only thirteen episodes. It based around a group of people with psychic abilities known as the Others. These ‘Others’ originally came together in the 1920’s and is carried on with one of the original members, Elmer Greentree (Bill Cobb,) sort of guiding the group along. Professor Miles Ballard (John Billingsley) ho had no psychic talents but serves as the organizer of the group- contacting potential members, researching paranormal phenomena, and maintaining the website, of course. The pilot centers on a young college student, Marian Kitt (Julianne Nicholson) who communicates with the ghost of a student who drowned in her dorm. It is revealed that Marian has struggled with her abilities to see ghosts all of her life. As a result of the ghost encounter, Marian is contacted by Professor Ballard, and becomes the newest member of the Others. The first episode gives the impression that the series will focus on Marian, but actually it doesn’t. Its an ensemble show in which each member has different psychic strengths and is the focus of an episode. There is Mark Gabriel (Gabriel Macht) a doctor and an empath who also resists his skills even as he uses them to heal patients. Ellen Pawlowski aka ‘Sartori'(Missy Crider) who embraces her psychic abilities and does the full on new age thing-yet even she doubts her abilities. (One episode $4.95 a minute in which she confronts a phone psychic as a ‘fraud’ but doubts how she is different is particularly effective.) Elmer Greentree, an original member from the 1920’s when he was a teen psychic talent-is used as a nice link to the present with historical anecdotes lead to a larger story arc. Warren Day (Kevin J. O’Connor), a man with zero social skills but an odd ability to see numerical patterns. Albert McGonagle (John Aylward),a bitter and disillusioned aging vet haunted by dreams of wartime. The flawed nature of the characters work because the actors are effective in their roles. Mediums, psychics, ghosts are standard TV fare, but I thought this show does a nice job of giving interesting and well-developed characters to follow. Plus, The Others was willing to be a horror show. Unlike other shows (Medium, Ghostwhisperer) where the outcome is family resolution oriented with some scary episodes, this focuses on the scary. Many issues remain unresolved. Some downright creepy. This was intended as a horror show and does that well. So, Smart Girls Readers, short and sweet this week, but any suggestions of other psychic/ medium related shows? Thanks for the detailed review. I was interested in this until you got to the “horror” label…. Glad to know! It’s a good show. Now gore horror, but it can be disturbing.